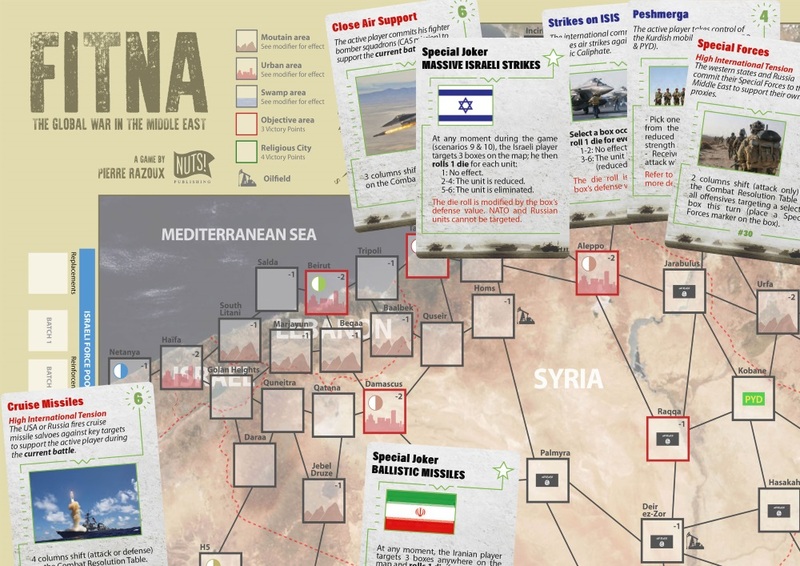 “FITNA (Schism in Arabic), The global war in the Middle East“ is a two to six-player grand strategic level card driven wargame depicting the military confrontations in the Middle East since 2012, up to the near future. Among 10 historical and hypothetical scenarios, players can simulate the war against the Islamic State in Iraq and Syria (ISIS), the Kurdish Rebellion, the Sunni versus Shia confrontation as well as Russian, Turkish, Israeli and Western intervention in the region. ISIS troops are activated through Event cards. This wargame allows you to have a clearer view of the local protagonists' goals and a real understanding of what is going on in this chaotic area. This is why it is used by experts and analysts to test prospective scenarios, as the iconic “Gulf Strike” used to be by US experts to plan the Gulf War. Each turn represents two months of real time and is divided into several phases allowing players to play events, to take reinforcements, to check supply, to spend operational points, to move units (mostly brigades and divisions) and to launch offensives. Each player gets 4 cards in hand allowing him or her to use them carefully either for creating events, spending operational points or supporting battles. The A1 map represents the Fertile Crescent (Kuwait, Iraq, Syria & Lebanon) and parts of Iran, Israel, Turkey, Jordan and Saudi Arabia. It is a point to point map containing 113 boxes depicting clear, mountainous, swamp and urban terrains, as well as oilfields and objectives. The 3 countersheets include a complete OB for all the potential belligerents, from tenacious Iranian “Al Qods” to the redoutable Israeli Armored divisions, alongside Saudi, Turkish, Iraqi, Syrian, Lebanese, US, French, British, Jordan and Gulf Monarchies units, including Kurdish and jihadist troops as well as all local militias (Sunni, Shia, Al Shams, Hezbollah…). 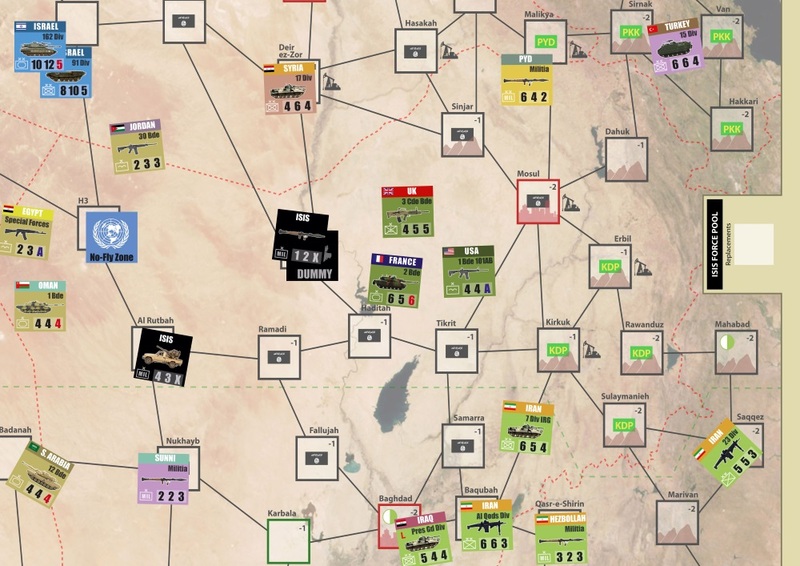 While using the same basic game system as “Bloody Dawn: the Iran-Iraq War” designed by Pierre Razoux, “Fitna, The global war in the Middle East” includes many new rules, assets and events characteristic of current wars in this region. An International Tension track simulates the growing tension leading to the arrival of extra reinforcements and the massive military intervention of the United States of America. Rules allow the two to six players to tackle 10 variously sized scenarios, from 2 to 6 hours of play, focusing either on historical or hypothetical ones. 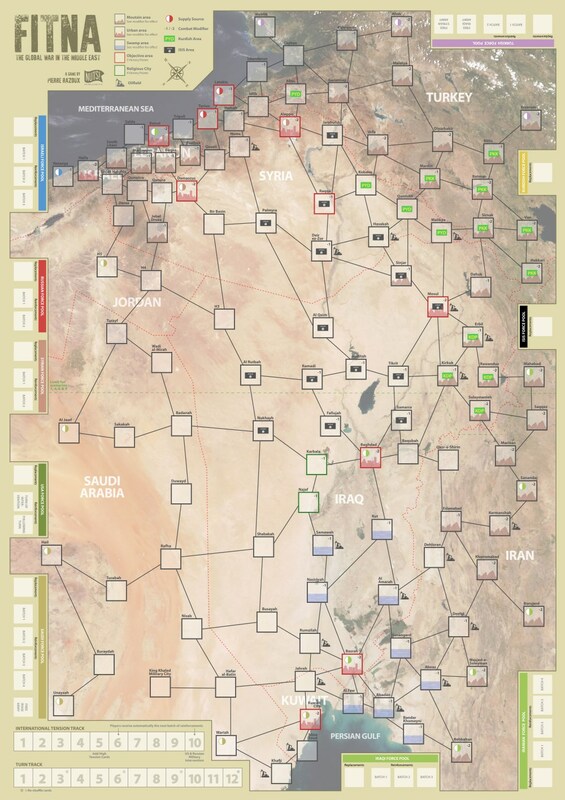 · “The civil war in Syria: 2012-2013” (tutorial for 2 players / 6 turns) simulates the first challenging phase of the Syrian Civil War, before any external actors have directly intervened in the conflict. This is manly Bashar al-Assad’s finest hour for survival on the one hand, and the Rebellion trying to overthrow him on the other! · “The fight against ISIS: 2014-2015” (2-4 players / 6 turns) covers the fight against ISIS at the maximum extension of the self-proclaimed Caliphate from the summer of 2014 and its establishment in Mosul and Raqqa, to the Summer of 2015 with the first setbacks suffered by ISIS. · “Russian intervention in Syria and the PKK rebellion in Turkey: 2015-2016” (2-4 players / 6 turns) portrays the military intervention of Russia in Syria in September 2015 to save the Syrian regime and stop ISIS progression toward Lebanon and the Mediterranean shore, as well as the Kurdish PKK rebellion in Turkey. It shows the complex geopolitical game between the regional actors, as well as the Iraqi efforts to regain lost territories with Iranian and Western support. · “ISIS’ collapse: 2017-2018” (2-3 players / 9 turns) simulates the battles for the liberation of Mosul, Raqqa and Deir ez-Zor in Iraq and Syria, with the progressive collapse of the jihadist organization. The regional actors can crush ISIS, but as soon as this objective is reached, their divergent agendas clash and each of them has to make crucial decisions. · “Iraq invades Kuwait again” (2 players / 6 turns); following the fall of ISIS, the collapse of the Kurds and the geopolitical turmoil in the Middle East, the Iraqi nationalist leadership decides to invade Kuwait again to boost Iraqi cohesion. Once again, the US backed by a coalition of the willing decides to expel Iraqi forces from Kuwait. · “Turkish military intervention in Iraq and Syria” (2-3 players / 9 turns); pretexting the geopolitical turmoil in the Middle East, the Turkish nationalist leadership decides to push its advantage and to reconquer former Ottoman territories in Syria and in Iraq, provoking the military intervention of Russia and Iran. · “The struggle for Kurdish independence” (2-4 players / 9 turns); following the collapse of ISIS, the various Kurdish factions reach an agreement to declare Kurdish independence, calling for Western assistance and launching a general insurrection against the central Iraqi, Syrian and Turkish governments. 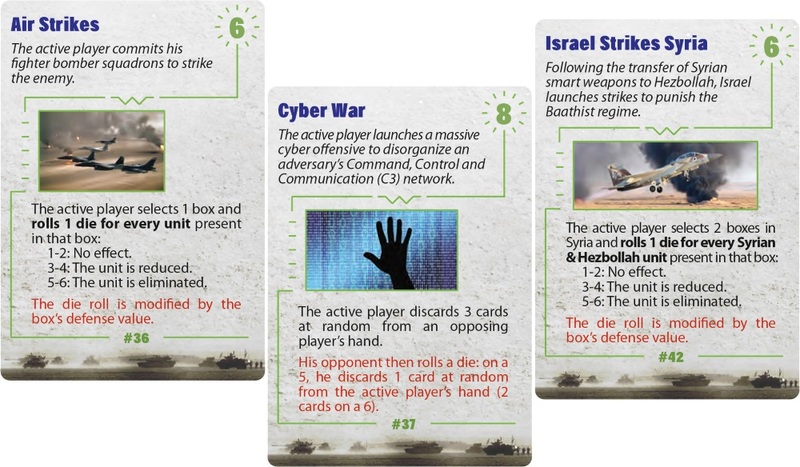 · “Limited war between Iran and Saudi Arabia” (2 players / 9 turns) simulates a direct military confrontation in Iraq between Iran and Saudi Arabia after a Coup in Baghdad, involving most of their respective allies. · “Israel attacks Hezbollah: Regional war in Syria” (2-5 players / 6 turns); The Israeli Defense Forces (IDF) attack Lebanon and Syria to eradicate Hezbollah and the various Islamic militias, as well as reducing the influence of Iran in Lebanon and Syria, provoking the direct military intervention of all regional actors. 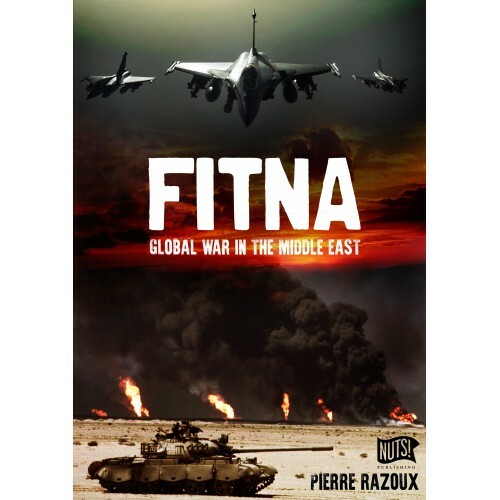 · “Fitna: the global war in the Middle East” (2-6 players / 12 turns) combines “Limited war between Iran and Saudi Arabia” and “Regional war in Syria” in a long hypothetical scenario campaign using all rules and counters. Optional rules will allow players to explore many “what-if” possibilities and 2 players to play multiplayer scenarios. Fitna has been designed to allow players to create their own scenarios to explore any new conflictual situation in the Middle East.